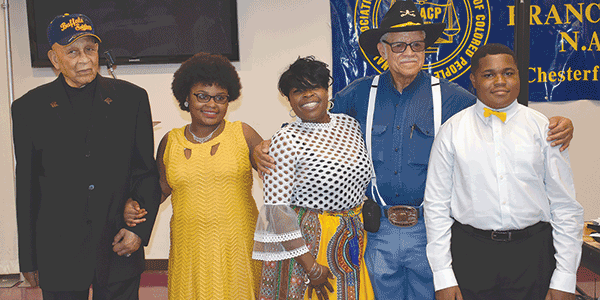 ABOVE: From left: Trooper John Nicholas, student hostess Tierra Wilcox, interim youth advisor Shawntell Greene, Trooper George Grady Sr., and student host Reginal Trent are pictured at a recent NAACP banquet. CHESTER – Dressed in uniform and surrounded by historic posters and documents, several Buffalo Soldier re-enactors were guests at the Chesterfield County’s Branch NAACP’s annual Freedom Fund Banquet Saturday, Aug. 4. Entertaining first with praise dancers and songs, Trooper George Grady Sr. gave a historic presentation of the Buffalo Soldiers. Grady spoke on the 9th and 10th Horse Cavalry, which were the last Buffalo Soldier divisions; Brig. Gen. Benjamin Davis Sr., who was the first African American brigadier general; and President Harry S. Truman, who issued the executive order that integrated the armed forces. Also attending were county administrator Joe Casey, chair of the Board of Supervisors Dorothy Jaeckle, police chief Jeffrey Katz, and a host of other county officials. 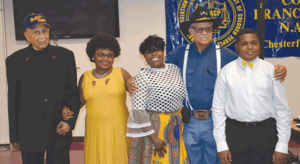 “Although controversial issues in the county are of public concern, the local branch NAACP continues to partner with county officials in order to manage the best results,” said L.J. McCoy Jr., president of the organization’s Chesterfield County branch.